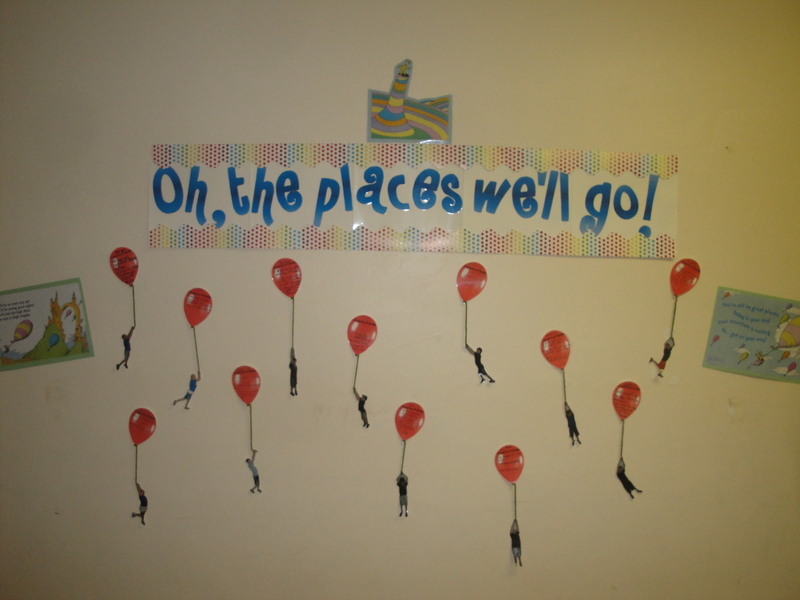 Towards the end of the school year, I wanted to create a display near our classroom that would be a sort of “good bye” to my students. I knew that I was going to miss them terribly! I know it’s really hard to see, but here’s what I did. First, I had each student list three goals they had for 6th grade. They could be anything from “Read 2 books each month” to “Get an A on every spelling test” to “Don’t be late!”. They listed some pretty awesome goals for themselves. Next, they copied these goals onto the cut out of a red balloon. Then I took their picture, having them pretend to be carried away. I printed out the pictures and cut them out, taped string to the back of their hands and wrapped the other end around the bottom of the balloon cut out, and voila! Now unfortunately, the pictures printed out a LOT smaller than I had anticipated. But I didn’t want to waste more paper/ink from the color printer at school; plus, it took me forever to cut all of their bodies out (I didn’t realize how small they were until I was done!). Oh well. Now I know for next year. To add to the display, I found some pages from the book to print out and I created the title from WordArt on Microsoft Word. I added some cute polka-dotted border. and there you have it! The students thought it was hilarious and loved looking at everyone’s pictures. I gave our 6th grade teacher a copy of all of their goals so that she can remind them at the beginning of the year what they were hoping to work towards.